NOTE: this chapter is about the Sellafield site as such and in particular about its old/former visitor centre. Since this has been closed, a new exhibition about Sellafield has been incorporated into the Beacon Museum in Whitehaven. The old text below is thus outdated, but I decided to let it stand for comparison with the new exhibition, though technically this chapter should now be filed under lost places. The site of Great Britain's most notorious nuclear plant! As such it's one of the very darkest tourist destinations in the country. And, unusually, you can (or at least could in the past) even visit it. 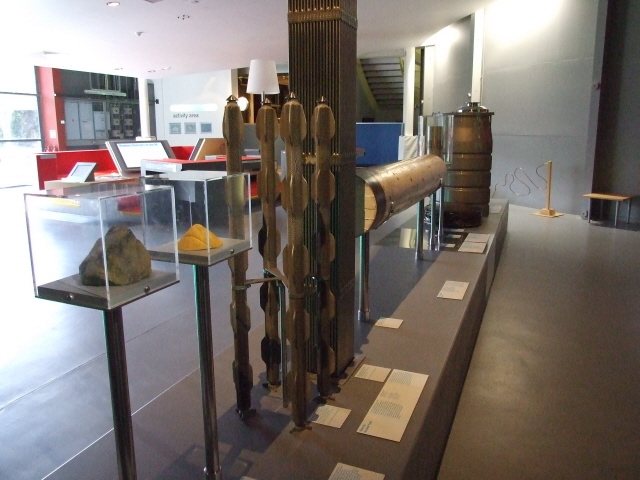 More background info: Not only did the world's first commercial nuclear power plant, Calder Hall, start supplying electricity to the population from here, it was also the centre for weapon's grade plutonium production for Britain's first atomic bomb and subsequently its Cold War nuclear arms arsenal. And the Windscale plant (an earlier name for a sub-complex at the site) was the first to have a major accident, in 1957 – also the worst such accident in Britain to date. Many other incidents followed during which radiation was released into the environment. The complex has also served as one of Europe's foremost nuclear reprocessing plants for many years. Today no nuclear power or weapons material is being produced here, and the site is being decommissioned. But that will take another 20 to 100 years or so to be completed (if ever it can be 100% completed, that is). In the meantime, the site is currently still in use, primarily as a storage facility for nuclear waste. Calder Hall power station was closed in 2003 (i.e. after 46 years of operation) and its distinctive cooling towers were demolished by controlled explosion in September 2007. 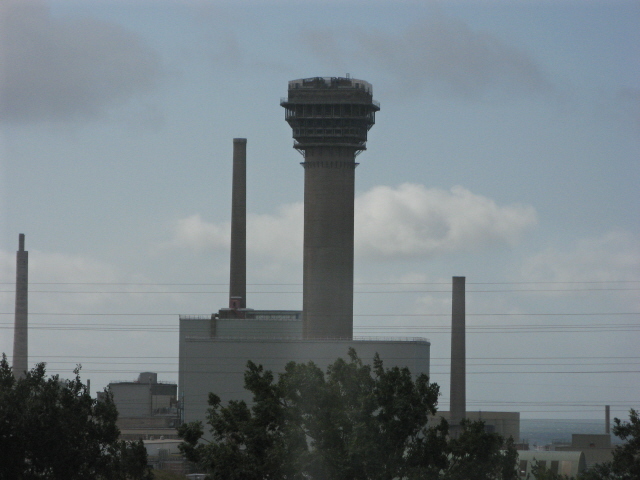 Other distinctive landmark elements remain, however, including one of the Windscale Piles heat chimneys and the sphere-shaped reactor building (similar to the one at Dounreay). Sellafield is one of the most recognized names in popular consciousness of any in the nuclear sphere. Electro-band Kraftwerk had it right: in their track "Radioactivity" the lyrics begin thus: "Chernobyl, Harrisburg, Sellafield …" – it's exactly in that order that these names are known globally, esp. for their sinister connotations. It's of course also the order of the relative severity of the accidents at those sites … even though others have occurred in other places since which were worse than Sellafield's, but their names don't have the same dark ring to them (Chernobyl still trumps the lot by far in any case). The site has not only been controversial with British and international environmentalists (e.g. Greenpeace) as well as in popular culture. Neighbouring countries' governments too have raised concerns about the site, esp. 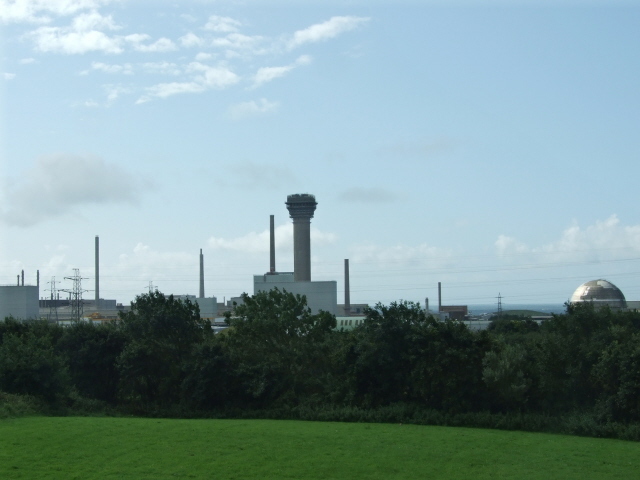 Ireland, whose most densely populated area on the Irish Sea coast is right opposite Sellafield. Norway also complained that sea currents wash Sellafield's radioactivity released into the sea all the way up to their coasts. Some of Sellafield's nuclear waste storage facilities (esp.- those from the days of nuclear arms production) belong to the most dangerous spots in the Western world. (though, again, the Russians' trump it with their Mayak site near Chelyabinsk). 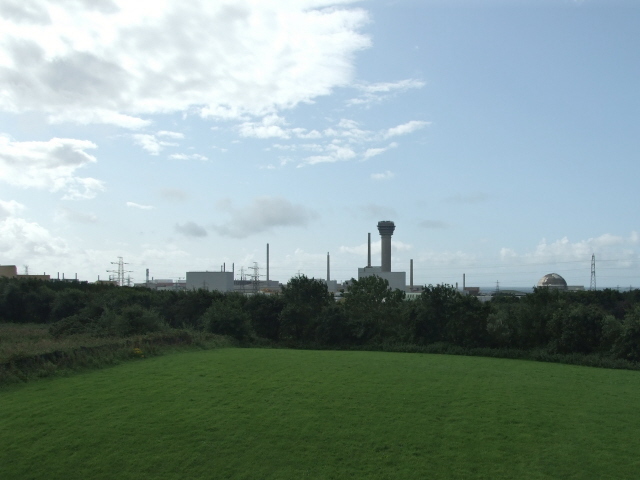 What there is (was) to see: Remarkably, there was a Visitor Centre at Sellafield – set back from the actual site, however the plant was clearly visible from the Centre's windows. 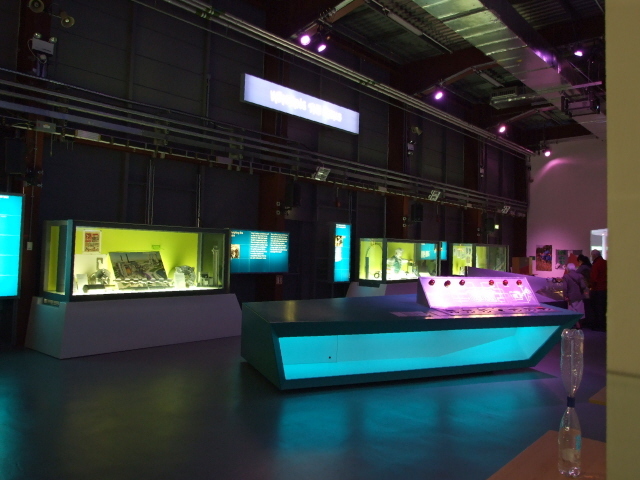 Currently, however, most of the Visitor Centre is closed and renamed just Sellafield Centre. According to the Sellafield site management's own website it's due to "ongoing maintenance work". According to Wikipedia the closurem was due to deteriorated popularity. It remains to be seen if the Visitor Centre's exhibition is to reopen properly and in what form. Currently only a small part is accessible and the rest of the Centre serves as a resource and meetings facility. It would be a shame if the exhibition at the Centre were not to reopen. When I visited in August 2008, I was very impressed with it – also surprised at how PC the exhibition tried to be. The accidents of the past and the continuing riskiness of nuclear energy generating were not concealed – as you might have expected in a place that has an interest in painting a rosier picture of all things nuclear (and is even supposed to be celebratory about it). The outlook for progress regarding decommissioning was portrayed very optimistically, of course (that's the present company's task, so …). But past sins were dealt with relatively openly, both on the national level, i.e. at Sellafield itself (esp. the Windscale fires of 1957), as well as the Chernobyl disaster (1986). 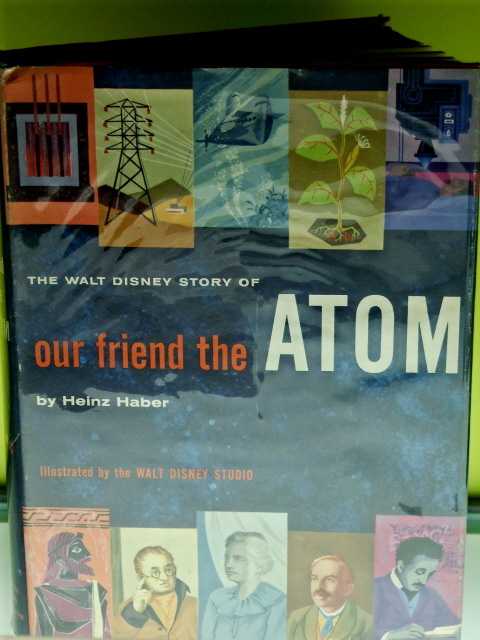 On the other hand, achievements of the atomic age were highlighted very much – here and there in rather an OTT fashion: a Disney brochure entitled "Our Friend the Atom" really cracked me up. Some exhibits and accompanying text panels were really quite educational. I learned more than I had expected, esp. about reprocessing and the high-risk radioactive liquid waste it creates. Other objects were more of the illustrative sort, speaking for themselves. 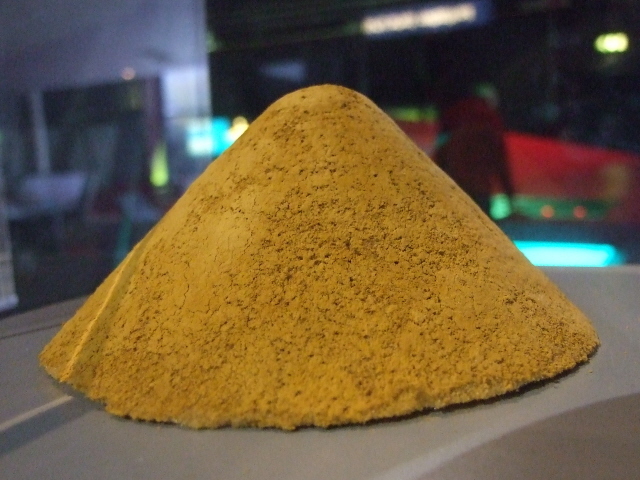 For some reason the glass encased small mound of yellowcake (an intermediate product in the production of nuclear fuel from raw uranium ore), even though not real but a replica, of course, had me more engrossed than the replica fuel rods or protective suits and other gear on display. The "highlight", in the sense that it teetered on the fine line between educational demonstration and a sick sense of humour, was the Control Chernobyl's Reactor interactive game console. 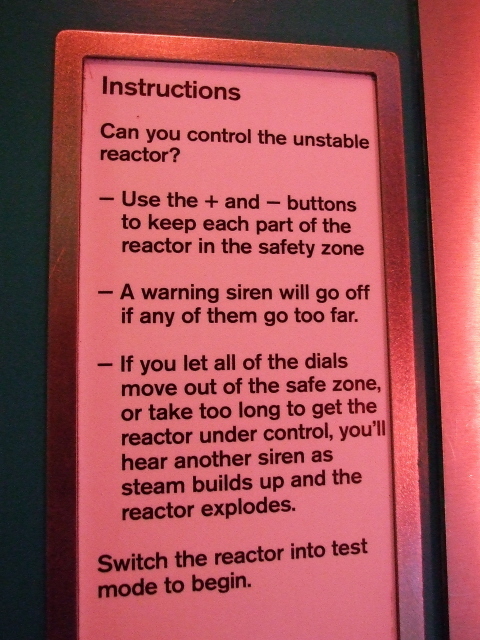 The instructions read (I quote verbatim in full): "Can you control the unstable reactor? / use the + and – buttons to keep each part of the reactor in the safety zone / A warning siren will go off if any of them go too far. / If you let any of the dials move out of the safety zone, or take too long to get the reactor under control, you'll hear another siren as steam builds up and the reactor explodes. 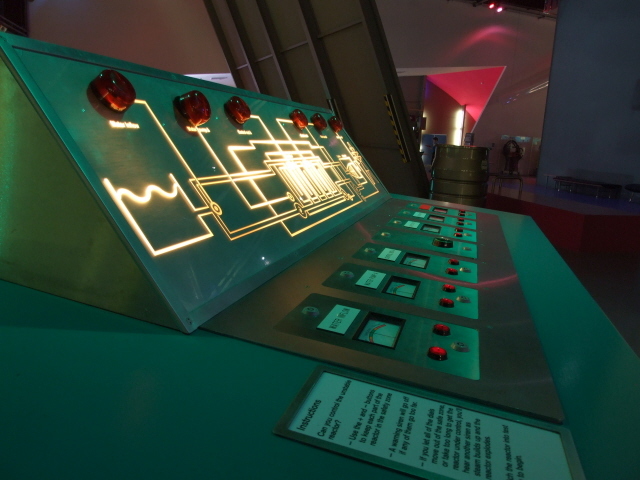 / Switch the reactor into test mode to begin" … I did, and it was hard! There were six sets of +/– buttons with meters over them and they all constantly went into the red danger levels, triggering the sirens. It was near impossible to keep them all under control simultaneously. Is this to demonstrate that the Chernobyl disaster was unavoidable? Anyway, playing nuclear catastrophe as an interactive game does take a very, very black sense of humour. I'm not sure everyone would have it in sufficient amounts … though I'm personally fine with it. At the end of the exhibition the outlook of complete decommissioning was described – including eventual landscaping the former nuclear site and returning it to public use in over 100 years' time (but who would want to live on such land?). With the outlook of green pastures the mood was supposed to be right for a snack and the adjacent cafeteria indeed offered a decent quiche that did the job. Whether any of this is currently still there I can't say. I'll try and keep on the ball and whenever I find out anything new about the Centre I will post it here. Keep checking back. (Or ring the Centre direct: 019467 27027). UPDATE 2016: it looks like the visitor centre will remain closed for good. Parts of the exhibition have meanwhile been transferred to the Beacon Museum in Whitehaven a bit further up the Cumbrian coast. 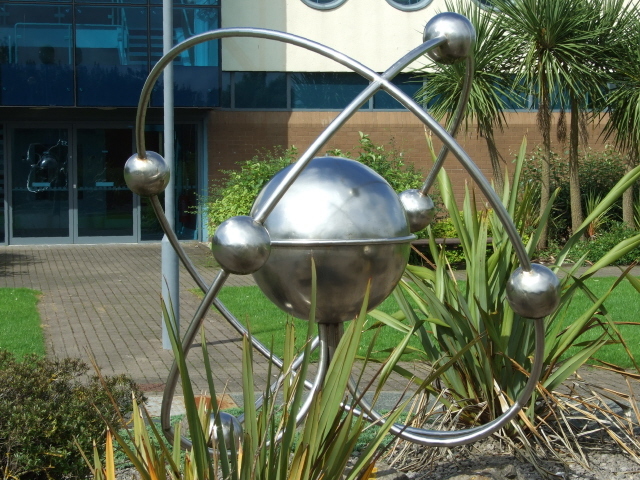 See the new chapter about its Sellafield Story exhibition.. Location: on the West Cumbria coast in the north of England, Great Britain, just to the south-west of the village Calder Bridge. Access and costs: in the past, relatively accessible and free, currently unclear. Details: to get to Sellafield Centre you can either take a train (Barrow/Carlisle line) and get off at Sellafield station (stops on request only!) and walk the two miles up to the Centre. Access by car is easier: from the main traffic artery that is the M6 motorway it's about 60 miles to Sellafield, either via exit 40 at Penrith along the A66 and A595 via Keswick and Whitehaven going west and then south; the access road to Sellafield Centre will turn off to the right at Calder Bridge – or from further south: exit 36 near Kendal and along the A590, A5092 and A595 going west and then north. Behind Calder Bridge turn left at the roundabout and follow the signs. The Visitor Centre charged no admission fee when I visited in 2008. 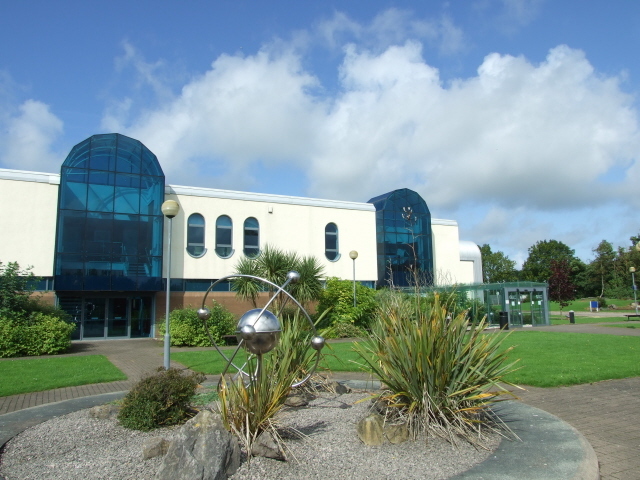 Opening times quoted by the centre are: 7:30 a.m. to 5:30 p.m. weekdays, 10 a.m. to 4 p.m. at weekends. To check the current status phone: 019467 27027. In the past it was also possible to go on tours of the actual Sellafield site. Whether that is still possible, I can't say. You could try checking with the Centre on the same phone number. Time required: if the exhibition reopens on a similar scale as it was in August 2008 when I visited, then up two hours would be adequate. Currently it's hardly worth going at all for the small part that is open (which could be done in ca. 10 minutes). Combinations with other dark destinations: for the new exhibition about Sellafield that in a way replaced the old visitor centre at the site itself see under The Beacon Museum, Whitehaven. In general see under Great Britain – the nearest individual other dark site (albeit of a very different nature) is Coniston's Ruskin Museum in the middle of the Lake District. Thematically related, but more than a day's drive away, is Dounreay on the Scottish north coast. Within slightly easier reach (a few hours' drive) is Hack Green nuclear bunker near Crewe. Combinations with non-dark destinations: Sellafield is close to the Lake District, which is famed as one of Great Britain's finest scenic areas, with lovely lakes and hills, offering all manner of water-related and hiking opportunities. It's very popular, though, and can get crowded in season.